When potential Military Members join the United States Air Force they usually enter through one of two Gateways To The Air Force. Future officers attend college at Colorado Springs Air Force Academy and enlisted trainees go through Basic Military Training (BMT) at Lackland AFB in San Antonio, Texas. Both places not only educate and train service members in warfare techniques they also help assimilate individuals into the Air Force culture. In the past, that culture has not always been kind to airmen of minority faiths like Paganism, but what is it like now? PNC-Minnesota spoke with Air Force officials, airmen, and civilian Pagan ministers involved at both gateways. On Tuesday we’ll take a look at the Air Force Academy. Today, on Veterans Day, we’ll head to basic training at Lackland. “We each walk our own path to the divine. Be it in a God/dess faith or not. Our airmen coming out of Lackland have been armed in so many ways with their military training. More importantly, they should know that the Air Force has gone to great lengths to ensure their spirit was nurtured while in basic training,” says Rev. Tamie Rieth of Sacred Well Congregation. She should know. She’s been the Wicca Distinctive Faith Group Leader (DFGL) at Lackland for just over 6 years. Rev. Rieth is one of 5 instructors who lead the weekly Wiccan services for BMT trainees. Approximately 150 to 300 trainees attend the two hour Wiccan services held in the Receiving Center each Sunday. Rev. Rieth and the other instructors spend the first hour answering any questions the trainees may have and the second hour is spent in meditation and chanting. As a mark of how important the military considers access to religious services, all trainees are briefed on religious service options within the first few days of arrival at Lackland. There is no pressure to attend religious services and no penalty or extra duty for airmen who choose not to attend a Sunday service. In a phone call with Lackland Public Affairs and one of the base Chaplains, each stressed they treat all religions, and those who are not religious, equally. Religious discrimination and harassment is not tolerated. A1C Justin Lindquist, a recent basic training Honor Graduate, said he encountered no harassment or hazing for attending Wiccan services, “Everyone there really didn’t care what service you were going to. There were people who went to the Christian services that weren’t Christian and people went to the Wicca services that were Christian and wanted to learn more about it or found the time more opportune. No one really cared.” He said between four and ten fellow airmen out of his flight of 45 attended Wiccan services. Our community has come a long way from when it was argued Pagans in the military were morally ineligible to self-identify as Pagan. It’s hard to estimate the number of Pagans in the military, but in 2002 the Military Pagan Network estimated there were over 1,000 active duty Pagans in the Air Force alone and over 100,000 service members and DOD dependents military wide. Judging from the number of trainees who attend the Wiccan services at Lackland each week, that number could be much larger today. How can you support military Pagans? Pagan Soldier Support Packages is a project to aid our community in collecting personal and magical supplies for Pagan soldiers in the Iraq war zone. You can either do this completely on your own, or drop off items to be assembled into aid boxes containing each a wide variety of items. We will also include information about UMPA and our pagan community. We collect individual items at any UMPA meeting or event, and at many regional events. If you wish to participate, and can donate the cost of shipping a box this is preferred. If you can just donate a few items, we welcome that as well. We do reserve the right to donate locally any items we find unsuitable for this project! provides support to Pagan veterans and Pagans serving in the US military and their families in a variety of ways. We sponsor Pagan Circles at US Army, Air Force, Navy, and Marine installations. The Air Force Circles we sponsor include those in the USA at Langley Air Force Base in Virginia and Sheppards Air Force Base in Texas, plus some overseas, Osan Air Base in Korea and Al Udeid Air Base in Qatar. Each year, we send Yuletide care packages for Pagan troops on active duty in war zones and elsewhere overseas through Operation Circle Care. Circle Sanctuary sponsors the Order of the Pentacle and the Pagan Military Association. In addition, Circle Sanctuary ministers conduct Pagan Warrior Blessing rituals at Pagan festivals and other events throughout the year across the country. For more than thirty years, we have been active in the quest for equal rights for Pagan veterans and troops and their families. A weekly program for Military Pagans, their friends, families, and supporters, which debuts with a special Veterans Day show on 11/11/11 from 8-9 pm CST. Pamela Kelly, who co-hosts with Rev. Selena Fox, is the DFGL at Sheppard AFB. Editor’s Note: Special thanks to Seshen Wolfsong, the San Antonio Pagans, and the San Antonio Military Open Circle Yahoo group for all their help. * name withheld as family is not yet aware of religious affiliation. PNC-News policy allows for withholding or substituting names of Pagans who are not public about their faith due to safety or family concerns. I wish that I would have had this option when I was in the Air Force. I’m very glad that it happened tho. Thank you so much for a very nice and well written article. I would, however, like to clarify a couple of points. Most people who do not work with the military in the arena of religious accommodation are clueless about the process (even some who do work in that arena are not as well-versed as they should be), and are totally unaware of the “backroom” work it requires. Pagans in the military are at a point today where they are accepted and can freely express their faith because of years of “backroom” work done, primarily, by the Sacred Well Congregation. Other people and groups have made significant contributions, especially after the notoriety of the fiasco with Bob Barr and the Fort Hood Open Circle (SWC) back in 1999. Prior to that time, most unaffiliated pagans and groups did not give a damn about military members who were Wiccan or Pagan. In fact many were (and some still are) openly opposed and hostile toward the idea that military members could be pagan in faith and military in profession. This is somewhat understandable in that contemporary Wicca/Paganism as New Religious Movements in this country grew largely out of the Anti-War Movement (as did the radical Feminist Movement) in the 1960’s and early 1970’s. There are some very specific requirements involved in forming an official DFG within military ministry programs supported by command and command chaplains. These basically require a supporting chaplain, a qualified Denominational Sponsor, and a qualified lay-leader endorsed by the Denominational Sponsor and approved by the Command Chaplain. For five years prior to the formal establishment of the Fort Hood Open Circle (SWC), the group had been seeking a Denominational Sponsor in order to receive official accommodation under the Command Chapel Ministry Program. They contacted virtually every group they could find seeking assistance. Every group they contacted was either not interested or not organizationally qualified to provide Denominational Sponsorship. In February of 1997, the group contacted the Sacred Well Congregation. After vetting the leaders and assessing the need, we agreed to be their Denominational Sponsor and began the process through the military, beginning with the Armed Forces Chaplains Board. The maiden ritual of the Fort Hood Open Circle (SWC) was at Litha, 1997, barely five months after they had originally contacted us. The FHOC (SWC) functioned very effectively and quietly as part of the Command Religious Ministry Program (CRMP) for almost two years. Then, in cooperation with the Fort Hood Public Affairs Office, we allowed the religion editor for the Austin American Statesman to do a human interest article on the group. It was a very good, and very neutral article. Then it was picked up by the wire services and caused a national / international media frenzy in the middle of which Rep Bob Barr (R, GA) tried to introduce a bill to ban Wiccans from serving in the US Armed Forces. After that, there was a general outcry and rallying of support from the “greater” pagan community, and much of it did more harm than good. Individuals and groups began coming out of the woodwork, some from altruism and genuine concern and support, and some because they saw a great opportunity for publicity; the latter category included Pete Davis and Isaac Bonewits (which was surprising given his published works that bashed military members and police officers who followed pagan paths). Prior to the so-called “Barr Wars,” the Sacred Well Congregation founded and sponsored four other military open circles (three of which are still active today); in the next few years we formed and sponsored a number of military open circles around the world and across Services, including the BMT Faith Group (SWC) at Lackland Air Force Base. We have also done extensive work with the Superintendent, Cadet Command Chaplain, and our endorsed Lay-Leaders, TSGT Brandon Longcrier (former) and Major Kelly Ihme (current) to insure religious tolerance and accommodation for cadets and permanent party personnel at the US Air Force Academy. Our collective efforts lead to the building and establishment of the Cadet Chapel Falcon Circle on the hill just above the Main Cadet Chapel. You might be interested in the following links. It’s also very important to acknowledge and include Forest Moon Grove when you talk about military support. They were one of the first Military Pagan support groups out there, created by military members because they had no one to go to. 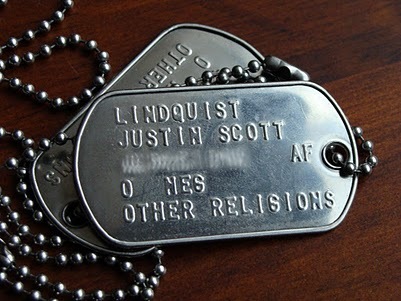 I retired from the Air Force in 1999 and had pagan put on my service tags in 1997. I did not flaunt it, and few knew I was pagan. I am really happy to see the AF is accepting pagans and wiccans as true faiths. Despite what people think, the military usually leads in the acceptance of minorities when the rest of the population still treats them as pariahs. Note the integration of blacks, the acceptance of women (I watched this one from 1979-1999 as more and more opportunities opened to me) and now the acceptance of gays. I am proud to have served in the nation’s military and to be one of the very few who has. I served in the Air Force from 1979-1983, and found that at that time the service was very accepting of minority religions. I’m glad to see that it has gone back to its roots that way. At least one other poster commented that they had had “Pagan” or the like on their dogtags in the 90s. When I got mine in 1981 (when I went on flying status), they read “Neo-Pagan, Wiccan.” So the option goes quite a ways back.